During this period, computers and later the internet had a growing presence in the library and reference services. The first reference areas to be impacted from computer automation were bibliographic searching and the library catalog. 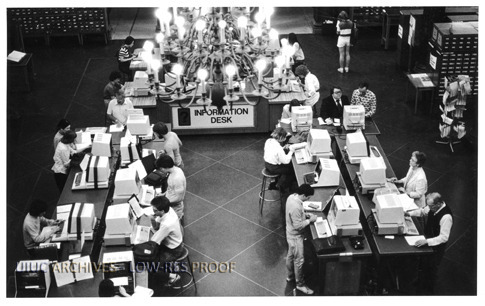 In 1976-77, the reference department was one of three locations (along with the engineering library and the health sciences library) to get terminals for using a system from the Bibliographic Retrieval Service to search large bibliographic databases. The New York Times Information Bank was introduced in August 1978, replacing the current events file that the department had kept with clippings from the paper. Also in 1978, the Library Computer System, which handled circulation, was created. The following year, the card catalog was discontinued and the Library Computer System terminal that was in the Reading Room became publicly accessible, with over 150,810 searches conducted in 1980-81. 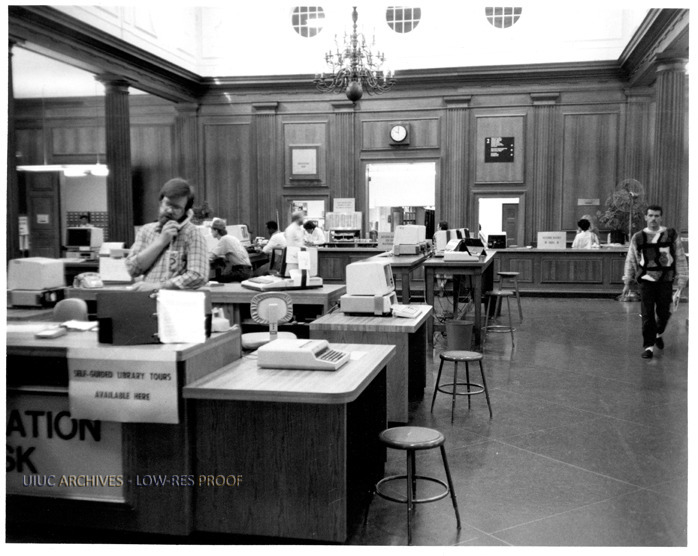 By 1979-80 the library had also expanded by subscribing to over 100 online reference databases. 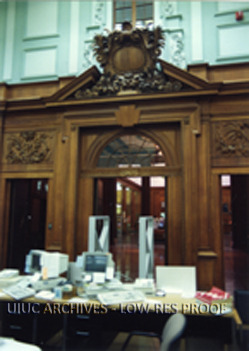 The first networked public access terminal in the Reading Room became available in 1994-95. Changes to the physical space and organization of the Reading Room also continued. 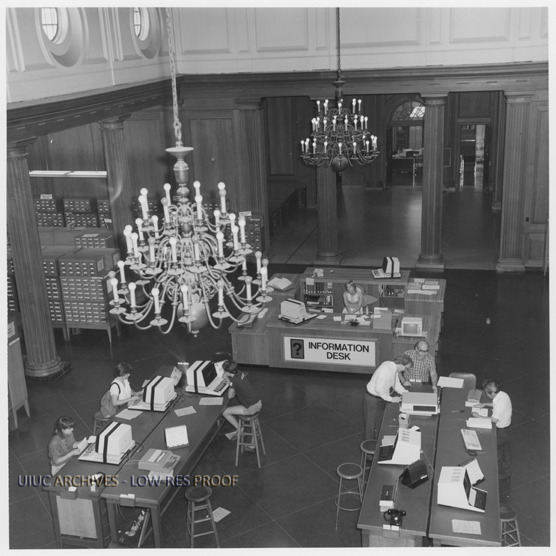 In the late 1970s, the counter-high reference desk that was in the Reading Room was removed for renovation and returned in 1979-80. While this service point continued to be available in the room, office space for the department moved up to the third floor. The Documents Library, housing government documents, moved into the south side of the Reading Room. During the mid-1990s, with the growth of the internet, needs were noted in the library’s annual reports for obtaining appropriate furniture to use with computer workstations and wiring the Reading Room to accommodate laptops. The reference department was also developing its own online presence after the introduction of the internet. 1995-96 saw the creation of a Central Reference Services homepage, as well as an Electronic Reference Sources homepage. By 1999-2000, this Electronic References Homepage had become the primary platform for access to licensed databases and significant free sites. This year also saw the creation of a website with links to frequently requested campus publications and resources. Along with the growth of computer and internet access for library resources, email reference service was introduced at the library during the 1995-96 year. The service was first made available from the reference homepage, and received an average of 8-10 questions a month. The following year there were still fewer than 100 questions during the year using email, but by 1998-99 the number was up to 304, with 55% of the questions coming from patrons not at the university. With improved visibility of the service on the library gateway the next year, the number of email reference requests again jumped to 793. With the increasing use of computers and the internet for library research, the department also began to offer related instructional opportunities. In 1996-97 there were workshops on the online catalog and the Internet. A few years later in 1999-2000, the department developed a workshop on using the Internet for research as well as a website and tutorial on basic Internet research strategies. 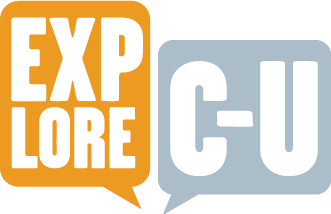 Sarah Hoover and Caitlin Crane, “Reference Services at the University of Illinois Library: 1976-2000 (Adapting to the Internet),” ExploreCU, accessed April 21, 2019, https://explorecu.org/items/show/324.